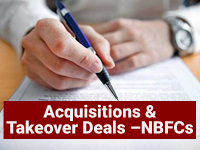 How does Acquisitions of NBFCs happen ? Residuary Non-Banking Companies (RNBCs) constitute another category of NBFCs whose main business is to accept deposits and invest in approved securities. However, RNBCs should offer a rate of interest of not less than 5% per year on term deposits and 3.5% on daily deposits, both compounded annually, under extant directions. RNBCs cannot accept deposits for a period less than 12 months and more than 84 months. Before investing in schemes that offer higher rates of return, investors should ensure that the NBFC offering such returns is registered with a financial sector regulator and is authorized to receive funds, whether in terms of deposits or otherwise. Investors should generally be cautious if the interest rates or rates of return on investments promised are high. Unless the NBFC accepting funds is able enough to earn more than what it offers; it will not be able to repay the investors as offered. For earning high returns, the NBFC will have to take high risks on its investments. Higher the risk, the more speculative are the investments, and there can be no assured return. The public should alert themselves that the possibilities of losing money in schemes that promise high rates of interest are more. 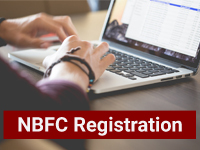 NBFCs including RNBCs can accept deposit only against issue of proper receipt. The receipt should mention the name of the depositor, the amount, rate of interest payable, and the date of repayment along with the maturity amount. 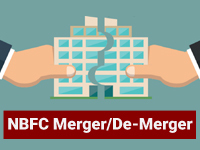 If the Bank observes, through its audit or inspection of any NBFC, and also through complaints or market intelligence, that one NBFC is not in compliance with RBI directions, it may prohibit the NBFC from selling its assets, or accepting further deposits. If the depositor has complained to the Company Law Board (CLB) which has ordered repayment and the NBFC has not complied with the CLB order; RBI can initiate prosecution of the NBFC, including criminal action and winding up of the company. Information received through SLCC meetings, etc. The Reserve Bank immediately shares this information with all the financial sector regulators as well as enforcement agencies in the State Level Coordination Committee Meetings. In the interest of depositors, RBI has a regulatory framework the salient features of which are published for the public regularly for the guidance of depositors. The investors should carefully evaluate their investment decisions while investing in NBFCs.